A few days ago I sat on a bee which for some unholy reason, happened to be sitting on my sofa. The bloody thing stung me through my shorts into my right buttock. All the family thought it was hilarious – even the dogs seemed to join in the joke. Thai bees look more like large flies than bees, but boy do they punch a powerful sting! It was effing painful! It took several hours for the pain to recede and all the while Lek and the kids laughed at me. At least Lek – in between paroxysms of mirth – put some Tiger Balm on the inflamed area. Whether it helped or not is debatable. After two days, the sting was still inflamed and was itching like mad. I walked around all day scratching my arse. “Suspend All Traffic Laws!” Say The Good Citizens Of Pattaya. Yes, truly, it could only happen in Pattaya. While everyone busied themselves cleaning up their shops and houses after the recent floods, the local business community decided to stage a protest at Pattaya City Hall. What do you think the protest was about? Financial assistance to repair damaged properties? An overhaul of the drainage system and infrastructure to prevent future flooding? Organise a PR campaign to help lure the tourists back to Pattaya? No, none of the above….. The group of protesters converged on Pattaya City Hall last Monday afternoon to present a petition to the Mayor to demand that the Police to “go easy” on law breakers so they can recover from the recent floods. The bizarre request was laid out in a petition which was handed over to the Mayor by a team of local businessmen. Remove all Police Checkpoints, as locals affected by the floods cannot afford the fines given to them for traffic infringements. Stop seizing vehicles and charging extra to release them from compounds. Comply with this petition by 30th September 2015. The Deputy Mayor of Pattaya accepted the petition and agreed to hand it over to the Pattaya Police Chief. He would not offer any guarantees that any of the points would be actioned by the Police who would probably argue that fines are given to those that break the law and their job is to maintain law and order at all times, without exception. He also didn’t mention that the Police would find it hard to pay their personal bills if they were deprived of the ‘income’ generated from traffic busts. Any possible repercussions from the protesters should their petition not be acted upon were not made clear to the Deputy Mayor. On the other hand…what a wonderful idea! Maybe the next time the folks in the UK suffer from flood damage, they can petition the cops and ask them to issue a blanket suspension on the laws prohibiting ‘looting and pillaging’. This will enable them to go out on marauding raids and thus replenish their flood-ravaged coffers. Long-time residents of Thailand will recall the tragedy that occurred eight years ago when a 25-year-old Thai man deliberately ploughed his Mercedes Benz into a crowd waiting at bus stop in the centre of Bangkok, killing one woman and severely injuring several others. It all started when the young man had a minor collision with a city bus which provoked a bout of road rage. He threw a stone at the bus driver’s head before returning to his Mercedes and driving it into the crowd on the sidewalk waiting at the bus stop. There were any number of witnesses to this terrible act, as well as photographs and video. Indeed the man in question didn’t even try to deny what he had done. This was eight years ago and the culprit has yet to spend a single night in jail. The Appeals Court sentenced him to serve three years in prison but it was commuted to two years and one month after considering his offences were committed at the time he could not control himself due to mental sickness. Then, after considering the ‘nature’ of the case, the court decided to suspend the two year prison sentence. He was required to report his behaviour to the ‘behaviour control officials’ ,(whatever they are – I doubt they even exist), every three months during a two-year probation and apart from that, he continued to enjoy his life of luxury and pleasure. At the other end of the scale, any Thai who is arrested for even the most petty crimes and has no money to defend himself is forced – often violently – to plead guilty in order to obtain a so-called reduced sentence for a crime they often did not commit at all. There are no court appointed lawyers. Prisoners awaiting trial are usually refused access to any member of the public before they make their court appearances – where they are intimidated into admitting their guilt. There are no juries in Thailand. Many poor Thais languish in jail for terms exceeding ten years for committing offences that are not even considered crimes in most civilised countries. Poor displaced farmers, trying to eke out a living on forestry land are seized by the police, thrown into jail and made to stay there for many years on dubious charges of ‘land encroachment’. But the Mercedes owner is very rich. He is a member of the privileged ‘Hi-So’ Thai society – which always looks after their own. 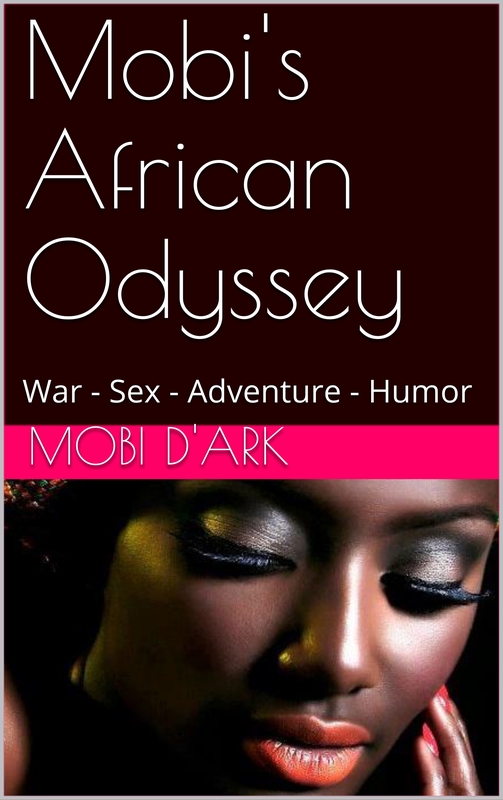 His mother is a famous beauty Queen, his father is a very rich, influential businessman and his uncle is a powerful police general. They paid one million Baht (£20,000) compensation to the families of the dead and injured, and they considered that this payment, plus probation for the culprit would be the end of the affair. But even though the families of the dead and injured agreed to drop their civil cases for compensation, they still appealed the suspended sentence handed down by the Criminal Court . It is now eight years later, and the culprit is now 33 years old. Guess what? A few days ago, the Supreme Court overturned the Appeals court suspended sentence and ordered that the man must serve the entire two years and one month sentence in jail. I suspect that this U-turn has come about due to the presence of the current military regime. We are at a time when the judiciary have to be careful and must be ‘seen’ to follow the rule of law in high profile cases. And/or possibly uncle’s influence is not what it once was, given the upheavals in the ranks of power since the coup. Even so, two years is nothing compared to the decades that ordinary Thais frequently have to spend in jail for much lesser crimes, but lack money and influence to help them obtain reduced or suspended sentences. Unfortunately, the few brave Thai lawyers who have tried to stand up for the poor and ‘underprivileged ‘ classes and to bring the Hi-So classes to justice tend to have a worrying habit of disappearing. These days, not many lawyers are prepared to take that kind of risk. Frankly I don’t blame them. Agricultural consultant Wyn Ellis, from Swansea, UK, was held at Bangkok’s International Airport a couple of weeks ago and was told he had been reported as a national security threat. He was held in ‘obnoxious’ conditions in an airport-holding cell for ten days, and feared he would be deported. This was despite the fact he holds Thai citizenship, has made his home in Thailand since 1985 and works with the UN’s environmental programme on sustainable rice production – something very dear to the Thai people and their economy. Wyn Ellis’s detention related to a nine-year-old dispute in which he proved that a former director of the Thai agency responsible for promoting intellectual property rights had plagiarised his PhD thesis on asparagus cultivation. In 2012, Thailand made national headlines when the accused high-profile government official, (ironically serving as the director of Thailand’s National Innovation Agency), was stripped of his doctorate title from Chulalongkorn University. The university investigation had determined that he had plagiarised 80 percent of the thesis that earned him his PhD. The Thai official was so incensed with Mr Ellis that he vowed revenge and somehow succeeded in putting Mr Ellis’ name on some kind of security watch list. It took intervention of the British Ambassador before Mr Ellis was eventually released, some ten days after being locked up in an airport cell. Over the years, Mr Ellis’s Bangkok home has undergone surveillance by individuals with false ID and false number plates, anonymous letters, long-running tax inspections, investigation of his Thai citizenship, 480 telephone death threats, and rock attacks on his car. This was all because he had the audacity to accuse someone ‘with connections’ of rampant plagiarism. Is it surprising that Thailand has so few heroes? 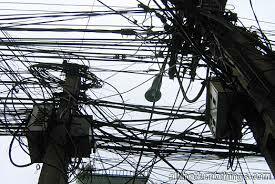 Have you ever spent too much time trying to untangle wires in your home? You know – all that maze behind your flat screen TV or maybe in your office with all those computer cables? Sometimes, just separating just one cable from another seems to take forever as quite by magic they have all acquired little knots, which, incidentally, my computer expert tells me will damage the cable. 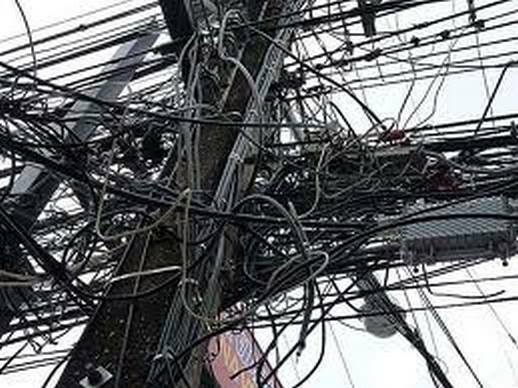 Can you imagine what it must be like if you have to unscramble all the wires that hang from the telegraph poles of Bangkok and the provincial cities of Thailand? Have you ever seen such a mass of inedible spaghetti? 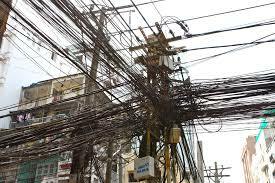 I raise the subject because I was delighted to read the other day that the familiar sight of messy overhead cables will soon disappear from 39 roads in Bangkok, covering some 128 kilometres. The project is a bid to improve the look of the city in preparation for the launch of the ASEAN Community at the end of 2015. The cost will be 143 million baht. (£3 million) and is being carried out to make the capital city a ‘beautiful tourist destination’. I have to say, that as fond of Bangkok as I am, (it brings back many happy memories), one thing I could never say is that Bangkok is beautiful. Exciting…energising…fascinating… maybe, but beautiful? I think not. A couple of days ago I was on my way to south Pattaya when I encountered a monster traffic jam along South Pattaya Road (Pattaya Tai). The reason for all this mayhem? There were no less than 10 giant hoist trucks spread down the side of the road, with 10 brave Thais perched aloft putting in new electricity cables. 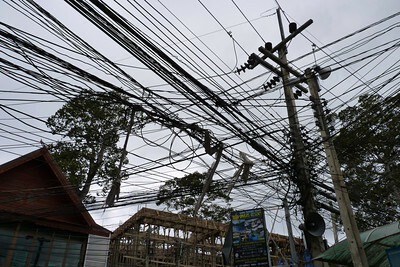 They weren’t going underground, like Bangkok, but I do believe this is the first time I have ever seen proper power pylons in any provincial town in Thailand – you know the type with coils mounted on the side of the poles to which the power lines are connected. Not quite sure what will happen to the rest of the old cables, of which there are thousands. I will watch how all this develops with much interest.